Shares of NetSuite Inc (NYSE: N) are trading 18 percent higher Thursday after Oracle Corporation (NYSE: ORCL) announced it would be acquiring the software company for $109 per share, a 19 percent premium. 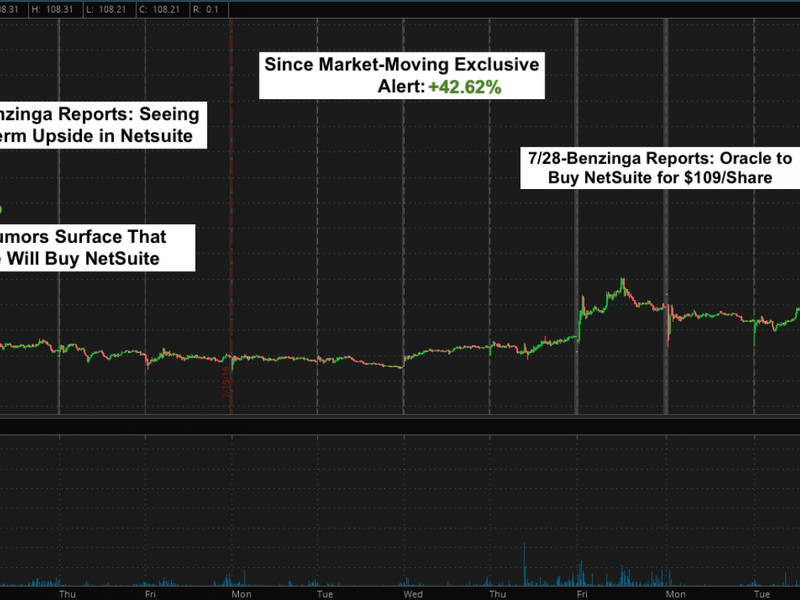 This acquisition comes two weeks (July 11) after Benzinga Pro alerted users of its Market-Moving Exclusive newswire to near-term upside. On July 12, shares rose 13 percent after rumors surfaced that Oracle would be making a bid for the company. Image below courtesy of Benzinga Pro. $90 July calls were trading at $0.40 per contract on significant volume four days before expiration, despite the stock trading at $75 per share. This suggested somebody was aware of information that would move the stock higher. The cost of the front contract moved higher than later contracts. Analysts have been mixed on NetSuite this year, with the average price target at $80.67, 34.6 percent below Oracle’s offer, suggesting the sell side wasn't giving much credence to a potential takeover. 2016 analyst ratings data courtesy of Benzinga Pro. At last check, shares of NetSuite were up 17.9 percent at $108. 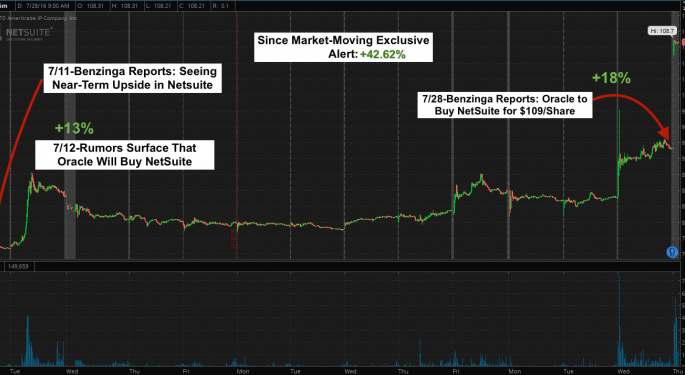 This is a 42.62 percent gain since Benzinga Pro alerted users to likely near-term upside.